In What You Need To Know About Credit Card Processing, we covered some critical tips to know about credit card acceptance and processing. The parties involved in credit card processing, tricks about pricing, and no-no’s when it comes to price increases, were all covered in our last blog. In today’s post, we’ll be going over processing fees for credit cards. At Journey Business Solution, we offer many merchant services, but one of the most helpful is credit card acceptance. With so many things going digital, providing your customers with access to credit cards will boost your sales and the longevity of your business. Credit card acceptance will allow you many capabilities, but the most prominent one will draw in consumers due to the monetary options. When it comes to credit card acceptance, it’s vital that you understand the overall processing fees. You might think that all that goes into accepting credit cards is signing up with a company like us that will play the middleman between the banks and your consumers, but a lot more than that goes into consumer purchases. By understand the overview of processing fees, you’ll know what you should be paying attention to in your monthly bills as well as ensuring you’re not overpaying. There are three types of processing fees: transactional, recurring, and one-off. Transactional fees are the transactions that are run at the business. These transactions can be broken down into interchanges and cents per transactions. 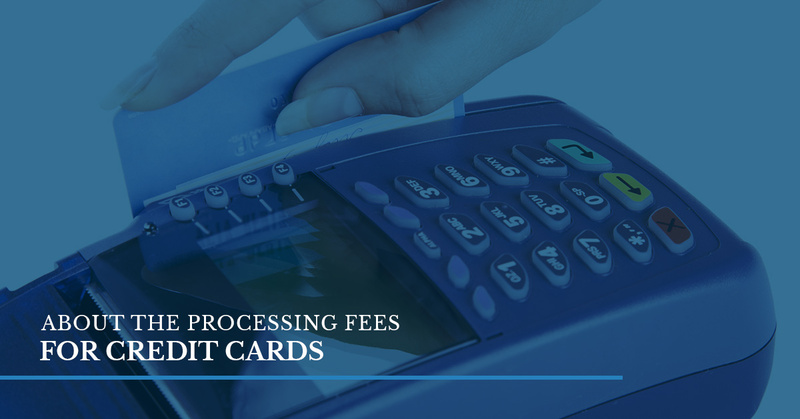 These are mandatory fees that are associated with credit card processing. The credit card processing is set up by the credit card companies. Essentially this fee is when you pay the credit association or the Visa, Mastercard, Amex, or the Discover card for providing the ability to accept these cards. The interchange rates can be based on the type of the card you’re running and how expensive it may be for the credit card company to finance the rewards, cash backs, and the other perks you receive with a credit card. Due to this, the interchange rates may be higher. Keep in mind debit cards may be less expensive and business credit cards are more. In addition to the interchange, there are some credit card providers who enjoy making a profit from charging the merchant fees for anything. The recurring fees are generally monthly statements and time and again. What you should know about these recurring fees is that they aren’t required to accept card payments. What you should keep an eye out for are the monthly minimum fees, the batch fees, the statement fees, the next day funding fees, the IRS report fees, the annual fees, and other fees that might show up on your statement each month. Lastly, there are one-off fees. These fees are triggered due to actions by individuals. The one-off fees can include early termination, setup, terminal, reprogramming, PCI compliance, address verification, retrieval, chargeback, and payment gateway fees. When you are looking at your processing statement, you should look at each of these fees to ensure you’re not being overcharged and you know about each one. When you come to Journey Business Solutions, we’ll go over each area you need to know to ensure you’re not paying any hidden fees. As a transparent business who is a small company, we want you to feel comfortable asking us questions and going over your processing fees. Do you have any questions about processing fees or credit card acceptance? Contact our company and have your questions answered.